Menus are subject to 21% service charge and 11.5 % sales tax. / Menus subject to seasonal changes. Pricing is subject to change. 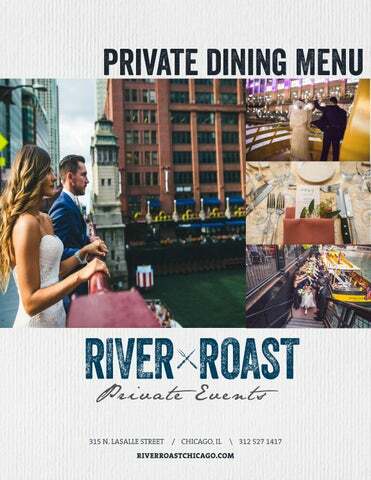 rehearsal dinner menu FIRST COURSE River Roast offers you the option of selecting multiple entrées based on your final guest count. Carrot Cake Carrot and parsnip cake, cream cheese icing, fried carrot shavings, cinnamon and sugar Chocolate Cheesecake Tart Peanut butter mousse Key Lime Pie Torched Meringue Torched meringue, classic Graham Cracker crust Mini Apple Cobbler Served in a mason jar with a cinnamon crumble on top Locally Roasted Metropolis Coffee, Decaffeinated Coffee and Assorted International Teas Menus are subject to 21% service charge and 11.5% sales tax. / Menus subject to seasonal changes. Pricing is subject to change. Dealer’s Choice Consult with OUR beverage director on curating your own customized experience. ask your sales manager for more information! Menus are subject to 21% service charge and 11.5% sales tax. / Menus subject to seasonal changes. Pricing is subject to change.